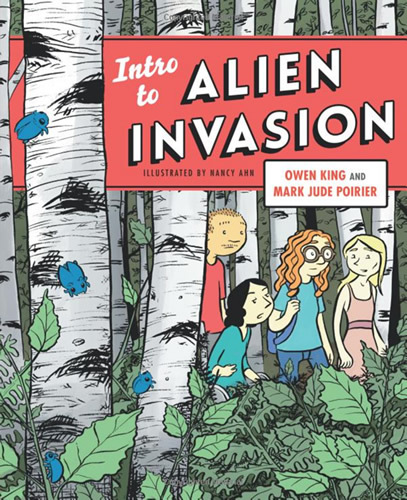 In this wildly entertaining collaboration, novelists Owen King (Double Feature) and Mark Jude Poirier (Goats, Modern Ranch Living) team up with illustrator Nancy Ahn to present a wickedly funny graphic novel about an alien invasion on a college campus. Stacey, a brilliant, overachieving astrobiology major at Fenton College, had planned on just another lonely Spring Break on campus. But when a hurricane batters the small college town, downing power lines and knocking out cell phone reception, Stacey and her friends are stranded with no way to communicate with the outside world at the worst possible moment: in the midst of an alien invasion. As space insects begin to burrow into students and staff, transforming them into slobbering, babbling monsters, a conglomeration of misfits must band together to prevent the infestation from spreading. Meanwhile, Stacey’s long-stifled romantic feelings for her friend Charlotte begin to surface, while the professor she had admired and respected becomes the students’ worst enemy. Illustrated with enormous wit and dynamism—mixing classic tropes from science fiction, indie comics, B-movies, and campus culture—this graphic novel is something different, a large-scale action/adventure story as seen from the point-of-view of a contemporary, realistic heroine. The result is a funny and singular work unlike anything else you’ve ever read.